6. Virtual Reality and Augmented Reality: What is Your Reality? 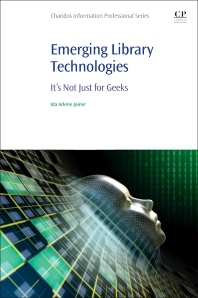 Emerging Library Technologies, is written for librarians/information professionals, teachers, administrators, researchers, undergraduate/graduate students, and others who are interested in learning about some of the most popular emerging technologies in the media today such as artificial intelligence, robotics, drones, driverless vehicles, big data, virtual/augmented reality, 3D printing, and wearable technologies. This valuable resource shows how they can be used in libraries and resource centers, and how to get stakeholder buy in for implementing these technologies. Discusses how to get key stakeholders on board before implementing emerging technologies including a checklist to complete before presenting your technology proposal to senior management. Includes resources at the end of every chapter on keeping abreast and building expertise on the emerging technology topic. Includes comprehensive glossary at the end of each chapter. Ida Arlene Joiner, MLIS currently serves as the Librarian at the Universal Academy in Texas. Previously, she was the Technology Coordinator for the National Network of Libraries of Medicine – Middle Atlantic Region (MAR) and a librarian at the Carnegie Library of Pittsburgh and Shaler Public Library. She was formerly a Project Management Consultant for several companies such as PNC Bank, PPG Industries, Tucker Arensberg, and Los Colinas Cancer Center where she saved them thousands of dollars in technical costs. Ida has developed proposals and presented them to get shareholders on board for implementing content management, learning management, website conversion, and other technology-related projects. She is a doctoral student in Texas Wesleyan University’s Curriculum and Instruction program. She holds her MLIS from the University of Pittsburgh and a BA degree in Business Management from Chatham University. She is a member of the American Library Association and the Library & Information Technology Association (LITA) Division and the International Relations Roundtable (IRRT) roundtable. She was a panelist on LITA’s Top Tech Trends panel where she discussed “Drones in Libraries” and “How to Keep Abreast of Emerging Technologies.” She holds several appointments in LITA including a member of the Information Technology and Libraries (ITAL) Editorial board. Ida is a member of LITA’s Membership Development Committee (MDC) also. She was co-chair of ALA’s IRRT Publication’s Committee. Ida has presented at the International Federation of Library Associations (IFLA) and BOBCATTS international conferences. She has published extensively on libraries, technology, and drones. Her research focuses on emerging technologies, their use in libraries and education, and how libraries can assist those who will be affected by emerging technologies.